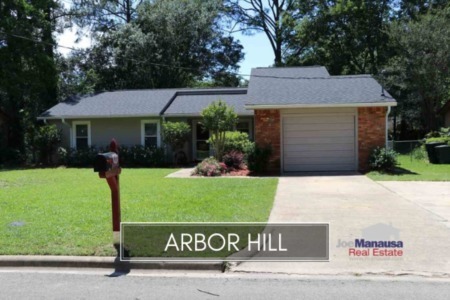 There are two types of homebuyers that should pay close attention to the Arbor Hill neighborhood in Northeast Tallahassee. First time homebuyers will love the fact that they can get a single family detached home and a yard for less than $150,000, while investors will appreciate the fact that they can buy an income producing property in the Montford Middle School (Lincoln High School) zone for under $100 per square foot. 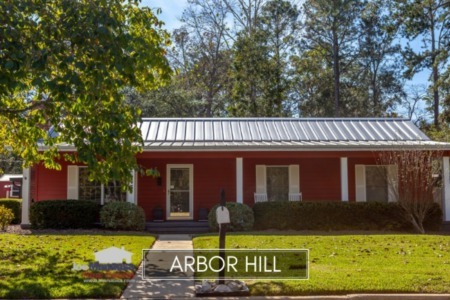 Arbor Hill is situated adjacent to Killearn Estates which means it is a neighborhood with excellent access to town and a premium location in Northeast Tallahassee. It is important to note that the narrative contained below is for sales through December for all previous years, but through the third week of November in 2015. The graphs and the closed sales table will be continuously updated into the future (meaning bookmark this page if you always want to know the current status of homes in Arbor Hill). Average home prices in Arbor Hill are drawing both first-time homebuyers as well as investors alike. Prices have dropped from the $160Ks down to below $120K, and that is just too much of a discount for such a high demand area in Tallahassee. Home sales activity has exploded since our last report on the Arbor Hill neighborhood, and that is exactly what we forecast in that report. There is no reason for a neighborhood in this location to have low values and low unit sales, and we knew that sales would return immediately. Now we know the next step is to see values return. Average home values in Arbor Hill have not changed much since they hit a market low back in 2012. They did move a little higher in 2013, only to come back down these past two years. Needless to say, these values are far below the cost of replacement, and people who purchase at these levels will look very wise within the next few years when home values return to Arbor Hill. Through the third week of November, the average value of a home sold in Arbor Hill remains at $96 per square foot. To find a home in this high demand area for less than $100 per square foot is a deal that will not remain possible for much longer. The average home size sold in Arbor Hill typically falls in a range of 1,100 to 1,250 square feet, and 2015 so far has seen the larger homes selling. The 21 home sales in 2015 have averaged 1,214 square feet, meaning recent buyers have been purchasing as much home as they can get. The following list shows home sales in Arbor Hill going back to 1991. I hope you enjoyed our November 2015 update on home sales in Arbor Hill, please feel free to drop me a note if you have questions not covered in this report.